Tax exemption refers to a monetary exemption which decreases the taxable income. Tax exemption helps in curtailing the burden of taxable income during a financial year. With the growth of our country’s economy, the amount of tax that we need to bear has gone up, and with each passing budget, the amount is only going on an upward curved direction. But there is indeed a way to save a particular portion of out hard earned money. And the rescuer comes in the form of tax exemption schemes. Given below is a list of Sample Tax Forms that you can use for your purpose. 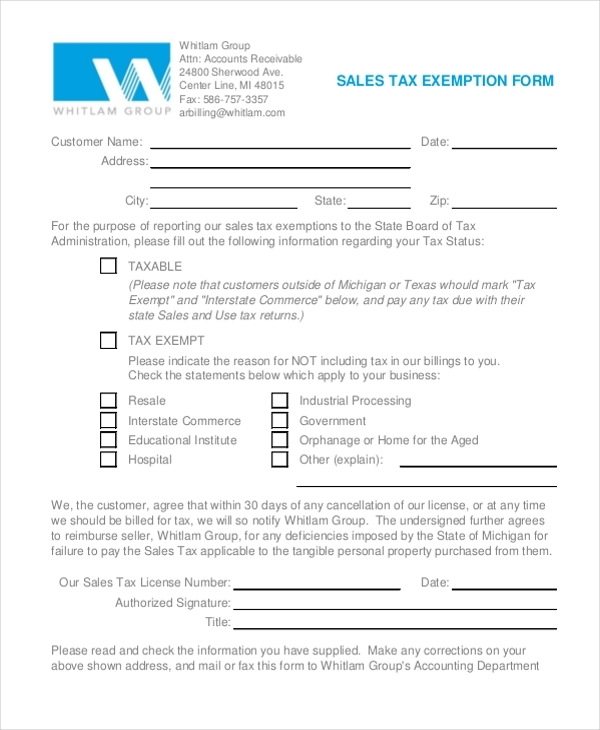 Sales Tax Exemption Form sample enable a buyer to make tax-free purchases that would normally be subject to sales tax. The buyer needs to fill this form and hand it over to the seller. Download this sample and use it for your purpose. 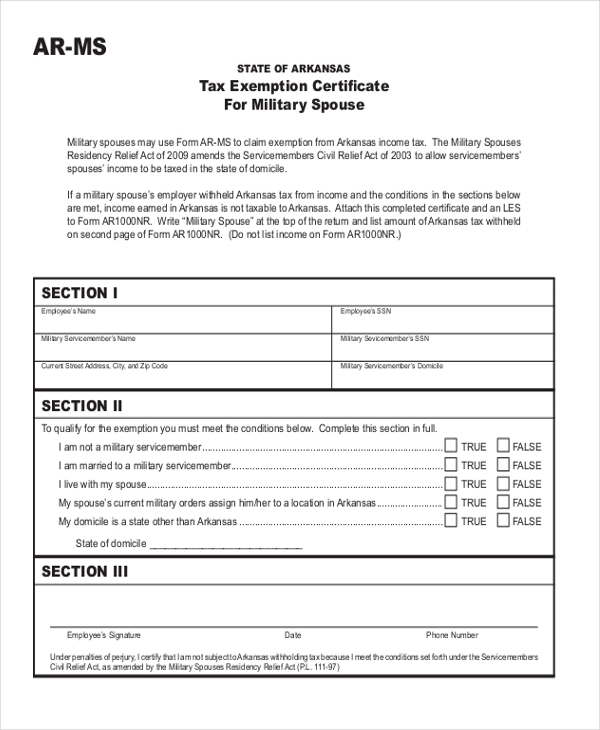 Military personnel can use this Military Hotel Tax Exempt Form and present it to the hotel to claim exemption from the hotel tax. Hotel operators will ask for a photo ID proof, business card or other such documents to verify the guest’s affiliation with the exempt entity. 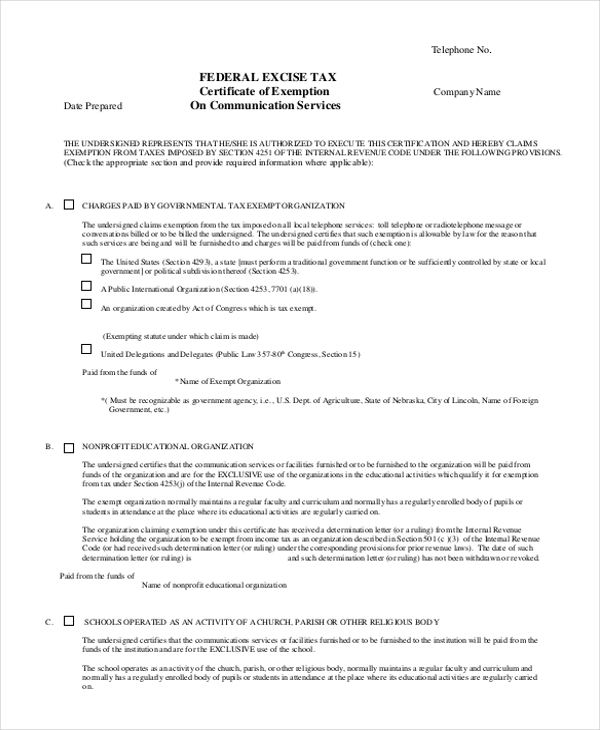 By using this Federal Tax Exemption Form sample, you will be able to claim exemption from taxes imposed by section 4251 of the internal revenue code. You just need to input your data into this print-ready sample as use it for your tax exemption requirement. You can also see the Federal Tax Forms. As the military personnel is the protector of the nation, they are bound to get tax exemption. This Military Tax Exempt Form can be used for such purposes. 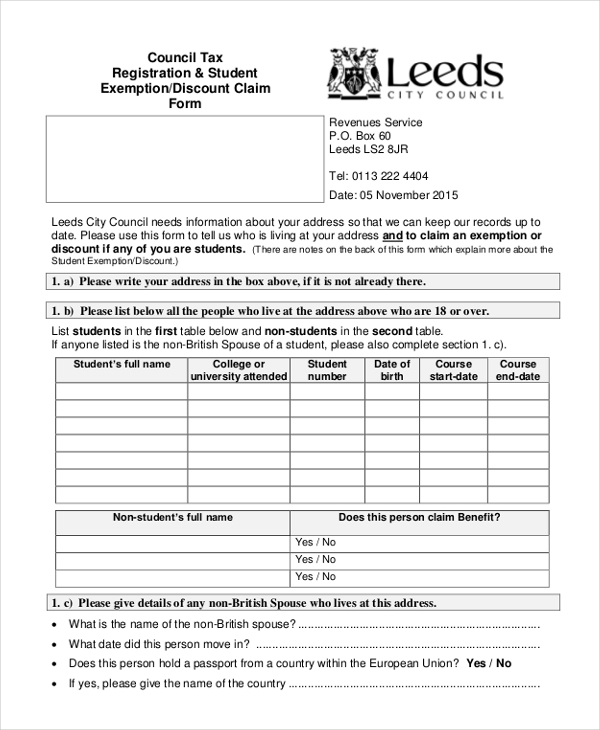 Student Council Tax Exemption Form can be used to get the exemption or discount as a student. If you are a full-time student, you may not have to pay any council tax. 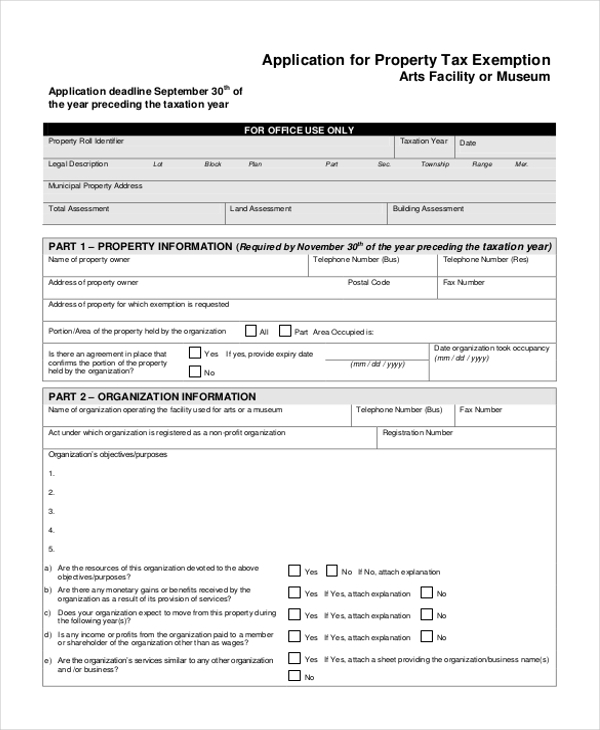 You can use this Student Council Tax Exemption Form for this purpose. Application For Tax Exemption Form is an ideal form format that includes all the necessary fields that you can use to avail the benefits of tax exemption. You can easily download this form, input your details and use it right away. Under specific government policies of the states, the property tax is exempted under particular conditions. 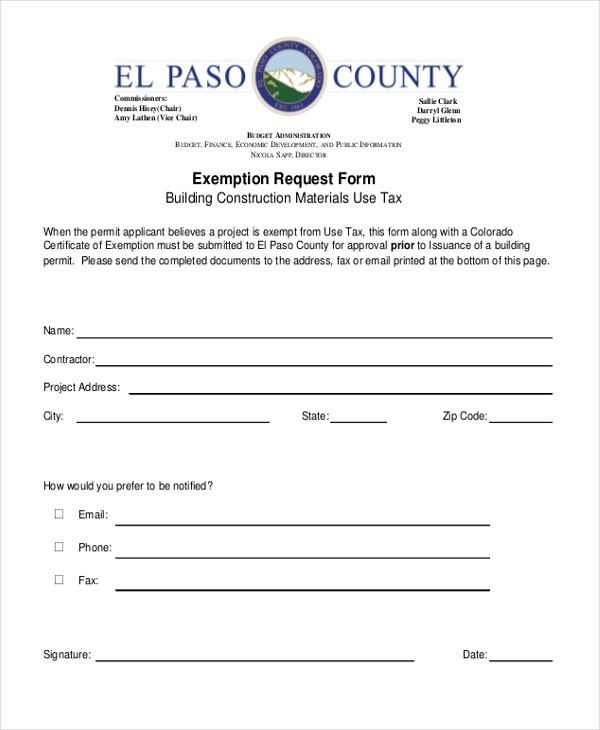 This Property Tax Exemption Form will help you in getting an idea about the requirements to apply for tax exemption under this category. Tax Exemption Request Form is not only useful for the earners, but it is also helpful in giving a comprehensive idea about the entire process. Law students can get an insight into the taxation system through these forms. 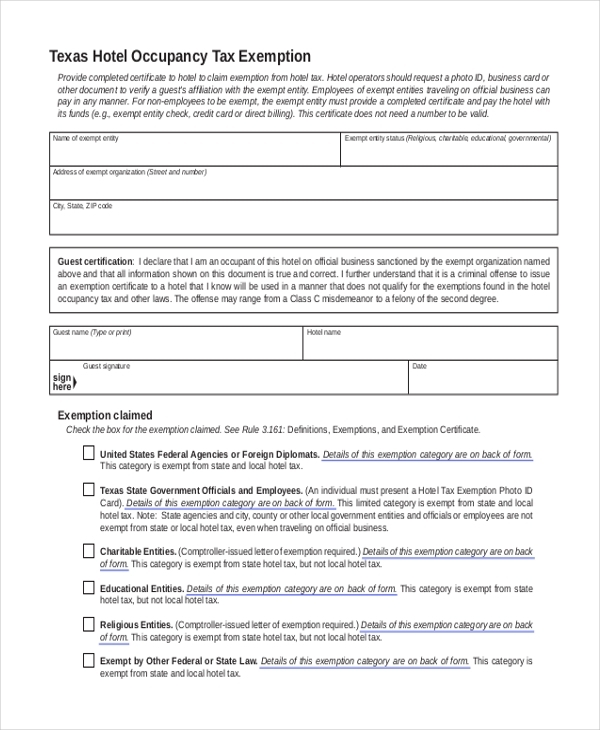 What are The Uses of These Sample Tax Exemption Form? The Sample Tax Exemption Form samples as mention above will ensure that you get the best idea about the process of taxation and the associated fields you need to deal with while applying for tax exemption schemes. The tax system is immensely complicated and rigid. And you will not be able to proceed further to avail the tax exemption benefits unless and until you have a very clear idea about what you should do and what you shouldn’t do so that you will be able to avoid legal tangles. Our samples are tailor made for your requirements. You can also see Tax Exemption Forms. 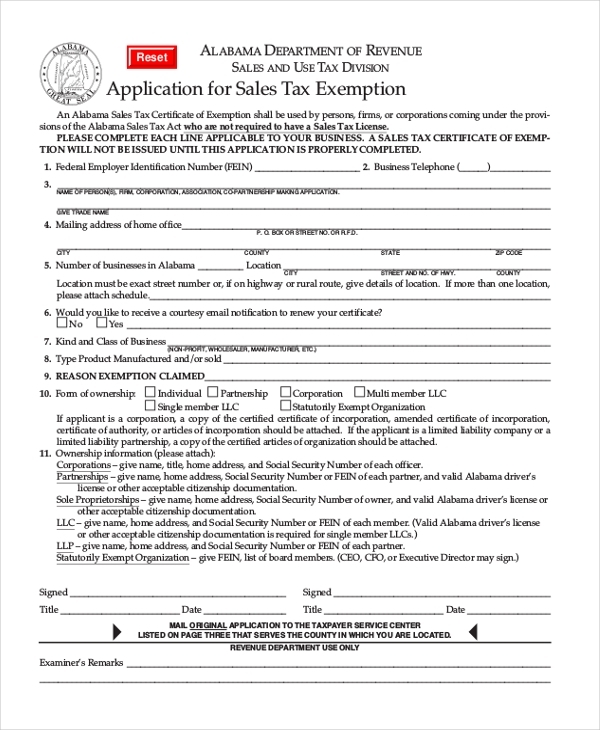 Who Can Use These Sample Tax Exemption Forms? These Sample Tax Exemption Form samples can be utilized by the common public who can be job holders; they can also be used by the scaled business and industry personnel. For availing the tax exemption benefit, you will have to meet certain criterion and fulfill some treaties. You will not be eligible to apply for such benefits unless you meet all the given conditions. And our Sample Tax Exemption Form samples will surely give you all the required information that you need to meet up to get the benefit and save your hard-earned money. You may also see Payroll Tax Forms. We have an extensive collection of Sample Tax Exemption Form samples and these sample forms are easily editable and downloadable. Before creating your form sample, we recommend you to go through the various form samples as it will help you in getting a clear idea about the whole process. After that, you can select the one that you believe suits your requirement to the fullest.